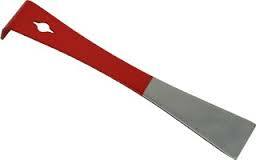 Think of the special tools that are required for baseball players, chefs, construction workers or teachers. These tools equip them to be successful, make their job easier and, when coupled with their expertise, produce great results. Similarly, beekeepers have a set of tools that offer protection and allow them to take care of their bees properly. The most important protection tool is the bee suit. It is made up of three main pieces: the veil, jacket and gloves. The veil is to protect a beekeeper's face, nose, mouth, eyes and ears from bee stings. It looks like a hat or hood with netting covering the face. This netting helps the beekeeper see clearly while protecting his/her face. Although honeybees do not want to sting, sometimes it happens, and it's important for a beekeeper to protect him/herself. The jacket protects a beekeeper's torso. It is normally made out of light colored, heavy-duty cloth. 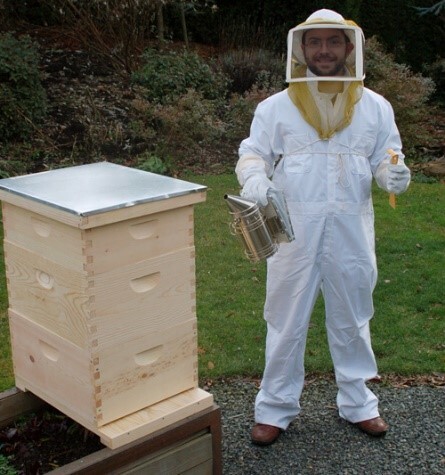 Bee suits are made with light colored fabrics to keep the beekeeper cool while he/she is working the bees in the heat of the summer months. Also, beekeepers don't wear dark colors to avoid intimidating the bees by being mistaken for a honeybee predator like a bear. The third piece of the bee suit is the gloves that protect a beekeeper's hands. The gloves are made especially for beekeeping. The gloves are thick and long, reaching above a beekeeper's elbow. There is a thin piece of elastic that hugs the arm so a honeybee can't sneak in. The hand portion of the glove is made of leather. Bees typically can’t sting through the leather portion, so a beekeeper's hands are safe from stings while working the hive. The hive tool looks like a thin metal bar that bends at one end. This tool is used to open up the lid of the beehive and to move around the wooden frames inside. Bees use a sticky substances called propolis (tree sap) to ‘glue’ the inside of the hive together to help insulate their home. This keeps it warm in winter time and cool in the summer. The hive tool comes in handy to unstick that propolis so a beekeeper can open the lid of the hive and move frames to check on the bees. Beekeepers use a smoker to calm the bees. When lighting a smoker, a beekeeper first opens the lid, fills it with wood chips, pine cravings or newspaper and lights this fuel to start a fire. Once there is a small fire in the barrel, he/she puffs the bellows to introduce a little oxygen to feed the fire. Then, the beekeeper packs more fuel in and waits for cool, billowy smoke to come from the barrel spout. The smoke needs to be cool so it will not hurt the bees. The beekeeper puffs the bellows to disperse smoke near the entrance to the hive and over the tops of the boxes. When bees smell smoke, they instinctively (automatically) start eating honey. Because the bees are busy eating food, their defenses are down while the beekeeper goes through the different frames in each box. Afterwards, the bees are full and content. 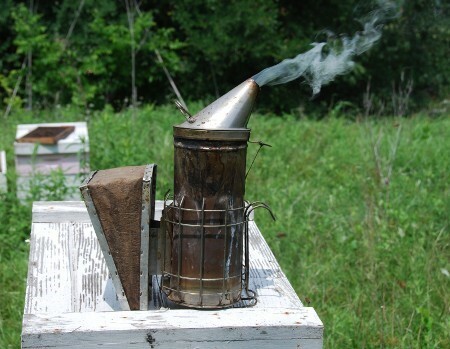 Beekeepers use smokers to calm the bees, but it does not hurt them. Beekeeping tools are necessary for a beekeeper's protection and help make it easier to manage healthy hives.